Turkish baklava – a rich dessert of filo pastry, nuts and sugar syrup. has a piece in it about baklava, but no recipe. Kitchen declined to include one, because baklava is one of those things that’s best done professionally, by people who make it all the time, using those generations-old recipes and techniques that will live forever. Reading that did give me pause for thought, but I’d had a piece of quite incredible baklava the other week at the Shipley Slouch, made by a local baker who’d also blogged the recipe. So, I’m left in a quandary – the closest thing to a direct instruction not to go near embedded in one of the best cookbooks I’ve had the good fortune to read in the last couple of years, and a barnstorming recipe that I know must be good, because I’ve tasted the results already. Baklava is a sweet pastry dessert of Turkish origin, rich with butter and sugar, loaded with nuts. It’s very, very tasty – sticky, crunchy, and heady with the pungency of cinnamon and rose water. Served in small diamonds, it’s unsurpassed next to a cup of strong, black coffee. Baklava is relatively straightforward to make, more of an assembly job than anything else, but it takes some time and needs some care and attention. Line a shallow tin with greaseproof paper and grease the sides with butter – the dimensions of the tin aren’t that important, but mine was about 25cm by 30cm and three or so centimetres deep. It’s an old tin, inherited from my Grandma and probably originating in the fifties at some point. The moral of this little digression? Buy the best kit you can afford, and it’ll last you a lifetime, and maybe even your grandchildren’s lifetimes, too. Melt 250g of butter in a pan over a gentle heat, and set it to one side. You’ll need a full pack of filo pastry, 250g. Take a sheet of pastry and lay it in the lined tin, trimming if necessary. Brush the pastry well with butter. Use a heavy hand and plenty of butter. Layer another sheet of pastry on top and butter it, repeating until you’ve got ten sheets layered up. A good base for anything. Now, the filling. Grind 400g of mixed nuts in a food processor until they’re coarse but still quite chunky. You can use any nuts you want – mine were almonds, pistachios, walnuts and plain peanuts. Add 100g of caster sugar, two and a half teaspoons of ground cinnamon and half a teaspoon of ground cloves and mix together well. Spread half of the nut mixture over the pastry base, then lay another sheet of filo over the top, butter it, then add another sheet and butter that as well. You see where this is going? 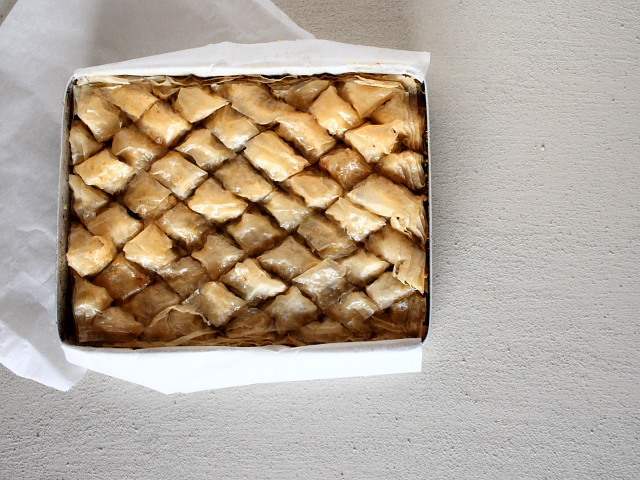 Use a sharp knife to cut the baklava into diamond-shaped chunks and bake at 140c for thirty minutes, then at 150c for another thirty minutes. Check every now and again to make sure that everything is colouring evenly. Baking isn’t the end. Baklava is steeped in a sugar syrup that soaks into the pasty and the nuts, welding it all together. Put 350g of caster sugar, 100g of honey and 350ml of water in a pan with two cloves and a stick of cinnamon, and heat it gently so that the sugar dissolves. When it does, crank up the heat and boil the syrup fairly hard for fifteen minutes, until it starts to reduce and thicken. Carefully add three tablespoons each of rose water and orange blossom water (tip: you need to visit an Asian supermarket), along with a good squeeze of lemon juice, about half a lemon should do, and mix it all together. While the baklava is hot, slowly pour the syrup over the top, making sure that the syrup covers everything. Tip the tin around, so that the syrup soaks through everything, cover with foil or clingfilm and leave for at least two days so that the syrup has the chance to do its job properly. The odd nudge and gentle shake to redistribute the syrup won’t go amiss. I’ve no doubt that baklava from the streets of Istanbul will be far superior, so on a sense, Kitchen was correct, but this is sensationally good in its own right and worth a go. This recipe is based on the one on The Very Good Bakery, which is also a Very Good Blog. Interesting view point – on leaving it to the professionals. Have recently had a similar conversation with Stephen Leighton of Hasbean coffee – re home made milky coffees (cappuccino, latte etc). He shares a similar view – the point is that a really good barista will have trained for years to make one. Whilst I agonise over whether to spend a fortune on a home machine, there are too many variables at play (better machine, better grinder, more training) that try as I might I may still never get the home coffee I want – but will end up with a big financial hole. I think with baklava it is that treat, the accompaniment with a good coffee – the slight concern about how unhealthy they are – that it might be best to leave it as a rare, paid for treat. One of my favourite things on the planet; not just for the taste, but because of the memories my wife and I have associated with Baklava from holidays and getaways. If there was such thing as ‘our’ dessert, this would be it. I’ve tried to make it a number of times and never *quite* get it right; i think you need to really make sure you get enough butter, enough syup – even when the amount is terrifying. So, in the spirit of the post, I agree; leave it to the pros – and you may even enjoy it all the more.